Canadian cannabis stock Tilray has, to put it mildly, been on a strange trip. Tilray's moves have been wackier than anything Harold and Kumar experienced on their trip to White Castle or Seth Rogen and James Franco's adventures in "Pineapple Express." Shares of Tilray (TLRY) have shot up nearly 50% in the past week, surging nearly 40% alone on Wednesday — a day when the stock was halted five times in the final 70 minutes of trading on the Nasdaq for volatility. The stock was up more than 90% at one point Wednesday and also dived into negative territory before recovering. Shares remained volatile Thursday, alternating between double-digit gains and sizable losses. 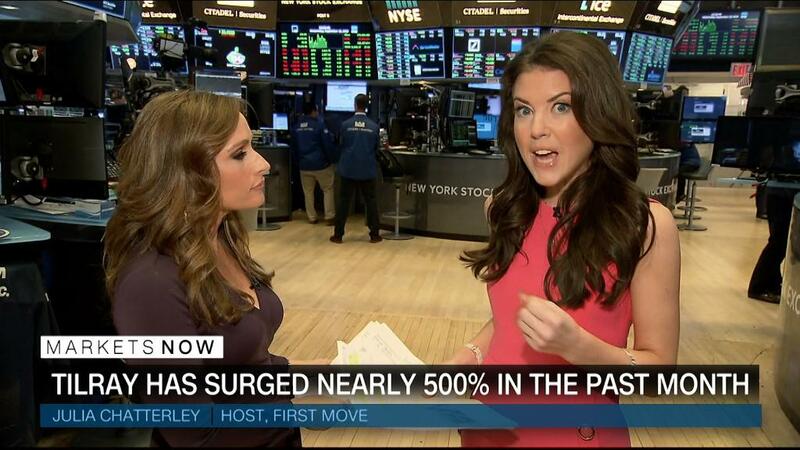 It was down about 20% in midday trading. But following the moves of the past week, Tilray's market value is a staggering $16 billion. It is worth more than Molson Coors (TAP), Macy's (M), Tiffany (TIF) and casino giants MGM (MGM) and Wynn (WYNN). Not bad for a company that just went public in July, isn't profitable and is only expected to generate sales of $41 million this year. So why has Tilray, which is backed by Peter Thiel's venture capital firm Privateer Holdings, suddenly become a Wall Street darling? The company's CEO, Brendan Kennedy, appeared on CNBC's "Mad Money" on Tuesday and told host Jim Cramer that cannabis is a "great hedge" for alcohol companies as more countries legalize recreational use of pot. Kennedy also noted that cannabis is being viewed as a substitute for painkillers and other prescription drugs. So it might make sense for pharmaceutical firms to invest in cannabis. To that end, Tilray also announced Tuesday that the US Drug Enforcement Administration had approved a plan for Tilray to import a cannabinoid capsule to America. The drug will be used in a clinical trial at the University of California San Diego for the treatment of essential tremor, a neurological disorder. Another drug company, UK-based GW Pharmaceuticals (GWPH), has already received approval from the FDA for the cannabis-based drug Epidiolex to treat seizures. Shares of GW Pharmaceuticals were up 10% Thursday and are up nearly 20% in the past week. But Tilray and GW Pharmaceuticals aren't the only cannabis stocks that have been surging lately. Legalization in Canada coming, but is the rally almost over? 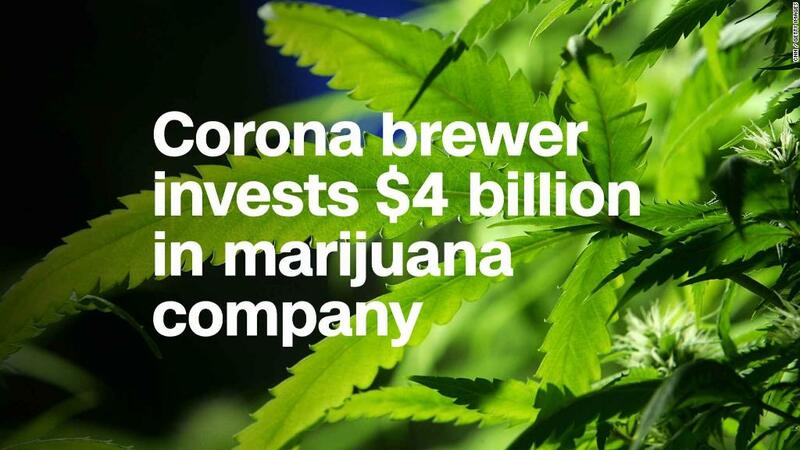 Canadian company Canopy Growth (CGC) has soared thanks to a $4 billion investment from Corona owner Constellation Brands (STZ) and plans for the companies to develop cannabis-based beverages. Canada's Aurora Cannabis (ACBFF) surged this week, too, on reports that Coca-Cola (KO) is considering making cannabis infused drinks with it. And Cronos Group (CRON) is up more than 30% in the past five days after it announced it was working with Canadian medical clinic company Aleafia Health (ALEAF) on a study that would use medical marijuana to treat insomnia and other sleep disorders. Canada is set to legalize pot for recreational use next month as well. That's also fueling the surge in pot stocks. But some experts worry that marijuana mania is another bubble in the making, just like dotcoms in the late 1990s, financial stocks in 2008 and bitcoin earlier this year. Those stories never end well. Many short sellers, investors who bet that a stock will go down, are building big positions in Tilray and other cannabis stocks. "The cannabis rally may be on its last drags," said Ihor Dusaniwsky, managing director of predictive analytics at S3 Partners, a research firm that focuses on short selling, in a report this week. Even pot industry bulls are getting nervous. He said it's a classic case of FOMO — the fear of missing out. And he warns that unless the US legalizes marijuana for recreational use, the current prices of most pot stocks are now way too high. "There is no basis in reality for these valuations," Tapman said. "They are not necessarily bad companies. But the projections are delusional."